An Auburn University gymnast has had enough with people tagging her in videos of her injury at a recent competition. An Auburn University gymnast has a simple message for everyone: "My pain is not your entertainment." Samantha Cerio dislocated both of her knees and tore multiple ligaments last week while performing a blind landing during a NCAA gymnastics competition, according to her coach. Video of the devastating injury, which some have described as "the worst sports-related injury" they've ever seen, has been posted online over and over again. Cerio is recovering after undergoing surgery to repair her injuries and declared Wednesday that she's had enough with people tagging her in the video of her injury. "Going through the pain and seeing my knees bent unnaturally in real life was horrible enough, but to continue to see it from videos/pictures because some people feel entitled to repost it is not okay," Cerio wrote in a note she shared on Twitter. "I have family, friends, and teammates who do not need to see me getting injured over and over again. My pain is not your entertainment," Cerio added. Auburn gymnastics tweeted out a video demonstrating how Cerio has been a great ambassador at the school beyond just competing. The program suggested if people want to watch a video of her, they should watch it instead. The Huntersville, North Carolina, native said earlier this week that she was retiring as a gymnast after a nearly two-decade career. After graduation, Cerio has a job lined up in Seattle with Boeing as a Structural Design Analysis Engineer. 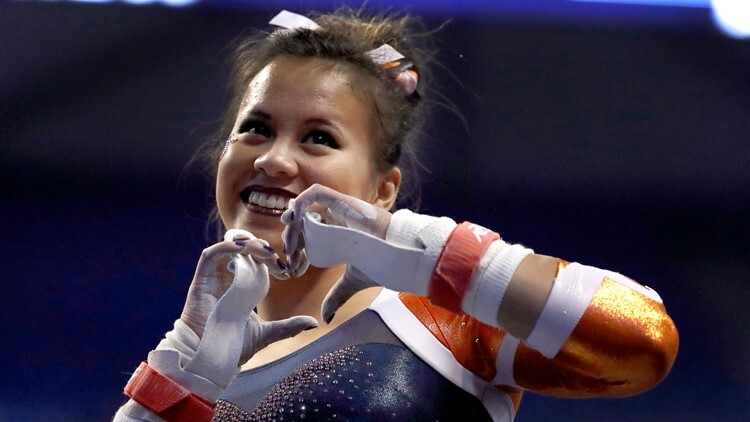 Auburn gymnastics coach Jeff Graba told NBC News that Cerio has set a goal to be able to walk down the aisle at her wedding in two months.